Complying with safety norms, as you’d know, is a job that involves a high degree of attention and implementation. The truth is that safety practices can be best implemented only once you know what safety challenges you are facing so you can resolve them. Trust me, it can be overwhelming. And, perhaps, you’ve experienced it already. Today, litigation is a scary enemy of businesses. So, they need to be doubly cautious regarding the health and safety provisions. The very first among warehouse safety tips to begin with is risk management. For this process, you need to carefully examine risks that can harm your workforce. Then determine whether you have things in place to avoid it or whether you need to take measures for prevention. If you think that the present warehouse management resources may not be able to do this risk assessment, hiring expert services should be considered. But, make sure you take this decision wisely. Simply walking inside and outside the warehouse can show the very scenes that indicate risks. Go ahead and consult your colleagues and subordinate staff about potential risks. The product safety instructions can also guide you about potential dangers which these products might pose. 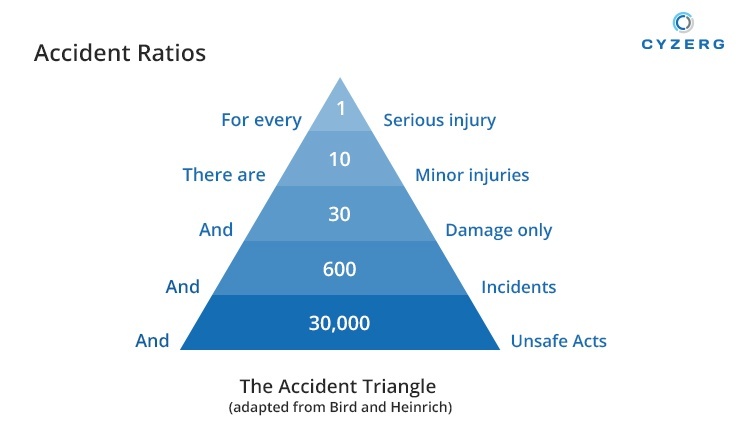 Here is an accident triangle, derived from the findings of Frank Bird and W.H. Heinrich, that defines the ratio of accident risks. It’s an excellent representation of how smaller incidents may lead to a bigger, serious one. For each risk that you determine, you need to know the vulnerable target. You need to list the workforce by classes and categories and see who are most vulnerable to what risk (safety as well as health). Consider those who spend maximum time in proximity of these hazards, those who come occasionally (cleaners, maintenance workers), and even visitors. Now, devise a warehouse safety plan. Some measures may be very small changes, ensuring there are no spills on the floor. Some may be big changes, like adopting new technology. This is the real deal – putting the results and findings into practice. Safety best practices include implementation and regular assessment of implementation. So, it is a continuous process. You need to first record these findings to ensures parameters for which you assess the measures. Then put the problem, its solution, and the action taken, all in one place. Then, you need to communicate your risk assessment to your staff in a way they understand. It is only with the implementation at the people’s end that will make your risk assessment work. As new additions and subtractions are made in terms of equipment and procedures, new risks may become evident. It is great to set a time-frame for reviewing the performance of your risk assessment, say every 3 months, or every 6 months, so that you can make necessary changes. Nevertheless, if a change is necessary immediately, don’t wait for the scheduled review date. 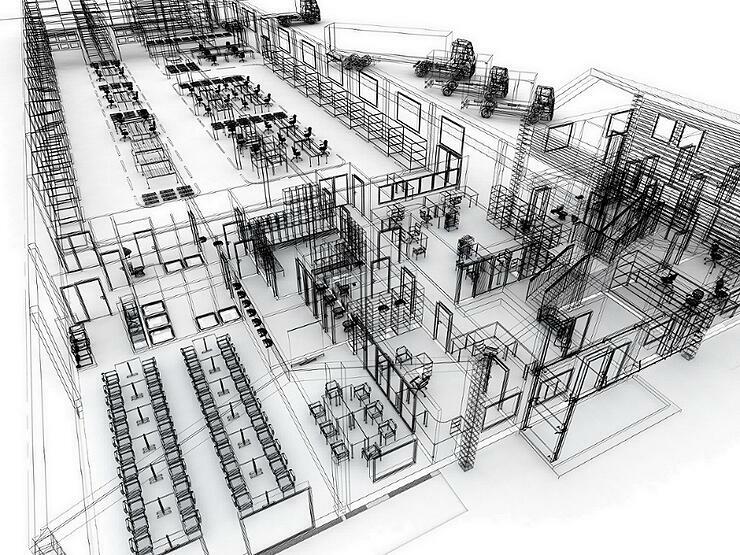 The design and layout of the warehouse should be such that allows safe mobility for people and goods. A well-laid and intelligently designed warehouse reduces the risk and number of accidents, particularly with slips/trips and vehicles. Some areas, the design of which you may review for ensuring safety are stairs/ramps, emergency escape routes, pedestrian walkways, storage isles and areas, racking, flooring, etc. You need to determine if they are safe for use the way they are, and if the staff are trained to work with them. 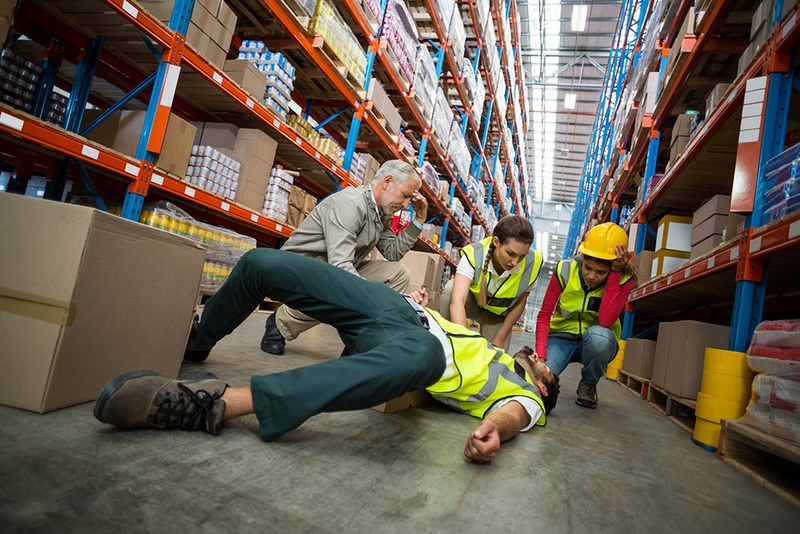 OSHA health and safety guides prescribe that warehouses have an emergency plan for execution in case of an emergency, especially fire. So, you need to ensure at least three things – fire/emergency exits and evacuation procedures; procedures that keep track of all employees and visitors frequenting the site; and the location of fire extinguishers, emergency water hoses, etc. As a matter of fact, apart from risk assessment, you should also conduct a fire risk assessment. During the year 2015, according to a report from the US Bureau of Labor Statistics, slips and trips were the second biggest cause of fatal accidents at workplace. Housekeeping is one thing that can prevent slips and trips effectively to ensure warehouse safety. And, there are simple things you can do to avoid these incidents. For e.g., cleaning spills on floor right away, not allowing clutter on the isles, providing proper shoes to workers and visitors, ensuring proper lighting, and most important, training your staff. Manual handling can pose health risks like back ache and neck pain to the handler. You must minimize manual handling while considering the load limit. The aim should be to deploy processes that pose minimum risk. Use of mechanical handling should be encouraged wherever possible and safe. In fact, automation is making notable advances in modern warehousing. You should train manual handlers for safe handling apart from providing them with personal protective equipment. You may also consider making some changes to shelves and racks in order to ease manual handling. This is one of the important areas where you need to implement safety best practices. It must be avoided and be made safer where it cannot be avoided. The staff working at height should be properly trained and must use personal protective equipment in the prescribed manner. You must inspect the process as well as equipment regularly. The very same 2015 report from LBS reveals that the biggest fatal accidents at workplace were transportation related. In fact, ‘drive-away’ (wherein the lorry moves away from the loading dock before the loading unloading is complete) incidents take a heavy toll on warehouse employees’ safety. Train your lorry drivers for handling the lorry during loading and unloading processes. You need to create immobilizing systems for the same, so that the lorry cannot move. Or, you could make an indication process for start and completion of the loading and unloading processes. You may also consider deploying safety guards to oversee the procedure and to instruct the driver about when to stay and when to move. Statistics from OSHA also reveal that more than 17 industrial accidents in 2017 involved forklifts. From experience, fork lifts can be one of the deadliest things around if you are not following safety precautions with them. 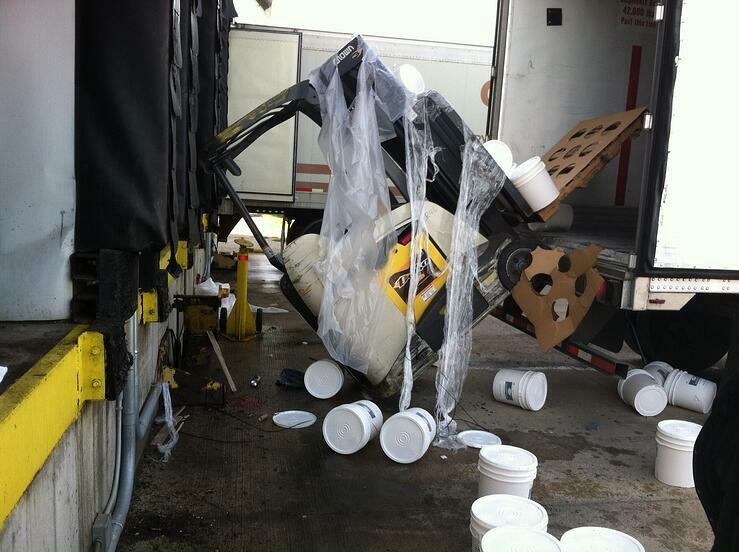 Never let untrained personnel operate fork lifts. Always have safety instructions recorded, reviewed and revised. Hold timely inspections and maintenance. Distance fork lifts from areas with pedestrian traffic/consider installing physical barriers. Keep an alerting system intact to alert the workers nearby that the fork lift is in action. Apart from this, you must always move with the legal provisions that a warehouse must meet. Also, always be sure to keep first aid handy. You should also appoint a person who can take charge in situation of emergency. Treating the safety of warehouse as an essential part of warehouse management can not only prevent you from a lot of unwanted situations but also sustain a workforce that contributes well to the business.